When it comes to analyzing oil prices in the shorter time frames, it can be very difficult. Here are some tips to help you navigate oil prices and be on the right side of the market the majority of the time. I always believe that you can follow the trend even in any time frame. Therefore, if you can determine the short term trend of the oil market you can navigate the oil markets better in that time frame. There are perhaps many other time frames that you can look at such as the 4 hour chart but I think a general study of the trend in these time frames will help you to be able to gauge where oil prices might be moving. Is oil prices in an uptrend or downtrend or in a sideways trend in this time frame? There is only 3 possibilities in the world of oil prices. Actually this principle applies to almost all tradeable instruments all over the world. Once you have determine the trend for that particular time frame all you need to do is to do what is profitable in that trend. These are general rules that will help market participants to trade or invest better. Of course there are turning points in the oil markets where market participants might want to spot reversal areas to enter early but this might take a lot of skill to be able to buy at the correct reversal spot. Once we deal with the trends we will go back to this topic of spotting reversal areas in the How To Enter A Trade Section. Let's take a look at some examples where we will try to determine the trend of the oil market. Take a look at the daily chart of oil prices above. From August onward oil prices begin to trend higher. One way to know that an uptrend is starting is to look for a bullish crossover. A sustained uptrend usually starts with a bullish cross. I like to use the 20 MA and 50 MA and you can use whatever MAs that you want as long as you familiarize yourself with it. The bullish cross of the MAs happen when the shorter MA which is the 20 MA crosses above the 50 MA. This is a bullish cross. If the 20 MA crosses below the 50 MA we call it a bearish cross. The above is a picture of strength and when you have these combinations, generally, it is very nice to ride the uptrend. Most people will make money in the particular instrument when the above scenario happens. I have highlighted the area that was conducive for longs in the chart above. Notice how nice oil prices rise during that period. Notice how in early February when the 20 MA decline a bit, oil prices had a volatile period. It is only when the 20 MA went back above the 50 MA that prices start to rise smoothly again. Since the 20 MA is above the 50 MA and price is above these 2 MAs, it is likely that oil prices will have a bullish run up in the daily charts. 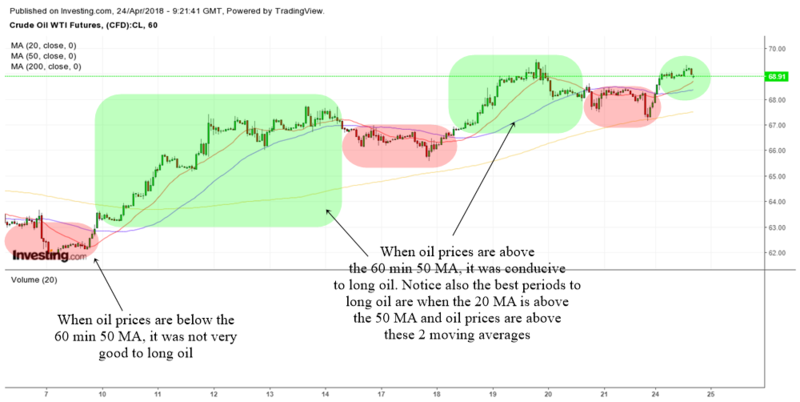 If you are a trader who likes to catch the short term trend of oil prices, it might be best to look at the 60 min chart and use it as your staple timeframe to do your analysis on oil. The best time to ride an uptrend in oil is when oil prices are above the rising 60 min 20 MA and 50 MA. The 20 MA should be above the 50 MA as well. Take a look at the 60 min chart of oil above and you will understand. I have highlighted the areas below the 60 min 50 MA as red. This was a time when it was not conducive for traders to long oil for the short term. In fact you could try to short oil. The green areas are when oil prices are above the 60 min 50 MA. Notice also how the best times to long oil is when oil prices were above the rising 20 MA and 50 MA with the 20 MA above the 50 MA. This is a picture of short term strength and if you like to long oil you should search for bullish setups when oil is in the green areas. Using The 60 Min 20 MA Or 60 Min 50 MA As A Filter? I have found it useful to use moving averages as a filter to know when to initiate longs or when one should initiate shorts. In fact many traders will use moving averages to execute their trading strategies. If the financial instrument is below a certain MA, then traders will not look for longs. They will look for shorts. On the other hand if the financial instrument is above a certain MA, then traders will look for long setups. You can use any MAs that you want but I tend to like to use the 20 MA and 50 MA. If you are the type of short term trader that loves to go in and out very fast, then a more sensitive filter will be the 20 MA as it reacts faster to price changes. On the other hand, if you like to hold things overnight and don't want to look at things every hour, you might want to use the 50 MA as it moves a bit slower and will catch the bigger trends. How To Enter A Trade? Moving averages can help us to filter the situations where you should long or short a stock or commodity. But in the end it is the particular trading strategy that will be used to enter positions. You should never enter oil without a solid trading strategy. Once you have determine that the situation is conducive for longs, you should look for bullish trading strategies to enter oil. A caveat here...I'm not an oil trader and seldom trade oil but I have found that moving averages and trend following work very well across many different type of financial instrument. Whether it is stocks or commodities as long as you follow the trend, you will be a better trader or investor. Let's take a closer look at the 60 min chart of oil above. The aggressive trader will be looking for instances where oil trades above the 60 min 20 MA. So he or she finds that around the 10th, oil forms an ascending triangle and it also trades back above the 60 min 20 MA. He or she can long oil for a more aggressive trade. 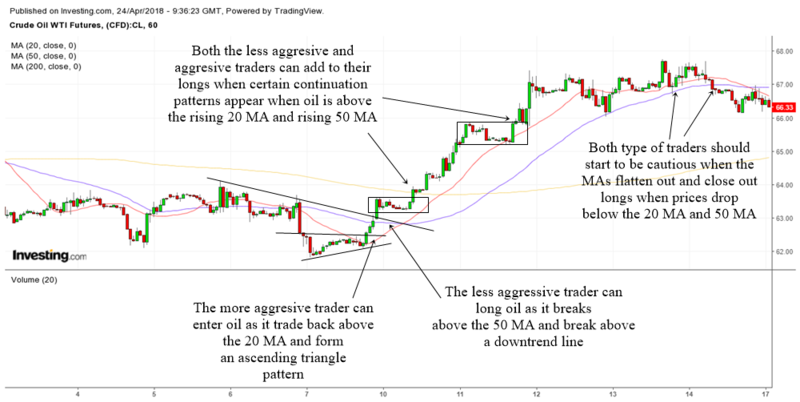 The less aggressive trader needs more confirmation and therefore he or she waits for oil to trade back above the 50 MA. As oil trades back above the 50 MA, it also broke above a short term downtrend line. This in itself is a trading strategy and he or she can long oil. 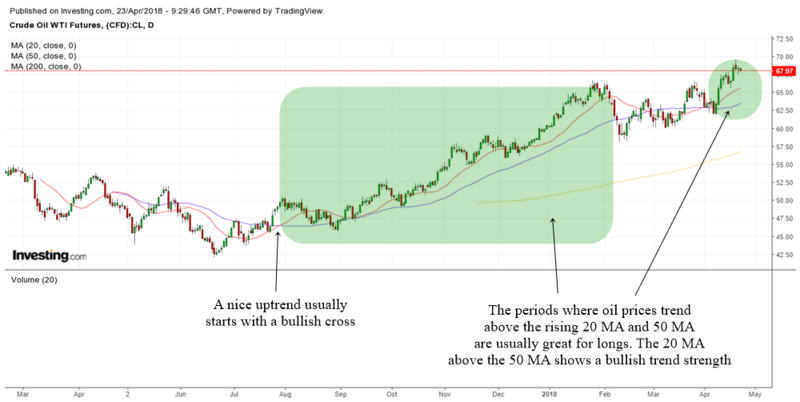 As oil prices rise, it moves back above the 20 MA and 50 MA and the 20 MA is now trading above the 50 MA which makes it a very conducive environment to long oil. The aggressive trader and less aggressive trader can look for box breakouts to add to their longs. As time passes by, oil prices begin to form a rounding type of pattern and the moving averages begin to flatten out. The trader needs to be cautious as this happens. When oil prices drop below the 20 MA as well as the 50 MA it was a time to get out of oil. Or at least one should not long oil anymore but wait for the conducive environment to appear once more.